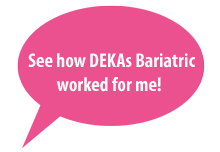 DEKAs Bariatric utilizes clinically tested delivery technology to enhance absorption of fat-soluble vitamins and nutrients. DEKAs Bariatric utilizes a clinically proven delivery technology to enhance the absorption of fat-soluble and other micronutrients. A prototype formulation has been clinically studied in subjects following Roux-en-Y gastric bypass (RYGB) and shown to be more effective than a standard multivitamin in maintaining therapeutic levels of clinically relevant vitamins and minerals and was more palatable (1). Nutrients tailored to your needs! Meets the latest clinical guidelines for bariatric surgery patients. See ASMBS Guidelines. Orange-peach flavor that is easy to take everyday! 1 Perin J, Prokopowicz G, Furtado M, Papas K, Steele KE. A Randomized Trial of a Novel Chewable Multivitamin and Mineral Supplement Following Roux-en-Y Gastric Bypass. Obes Surg. 2018 Mar 2. doi: 10.1007/s11695-018-3177-0. 2 tablets daily or as directed by a physician. Rite Aid, Target, Walmart or other pharmacies that use McKesson (drop ship, #3906096).